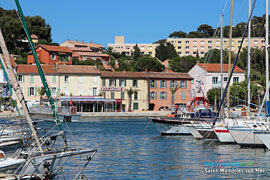 St. Mandrier is a charming little fishing and boating port set right on the peninsula that encloses the port ot Toulon. The rough coastline is made of many steep inlets and creeks well appreciated by fishermen, scuba divers, and swimmers. 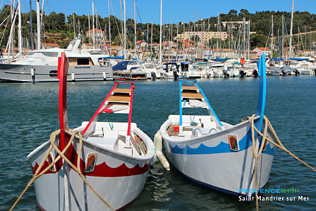 As you arrive by the scenic route you will discover a unique view of Toulon and the bay of Tamaris. From the Franco-Italian cemetery, La Pyramide de l'Amiral de la Touche Tréville, there is a wondertul view of the lles d'Or. 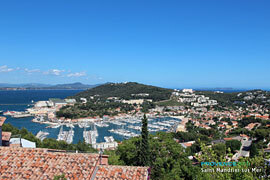 The three hills which surround St. Mandrier make for a rich green background where one can find walking trails. The presqu'île, because of its different tourist attractions, is becoming more and more appreciated by visitors in all seasons. 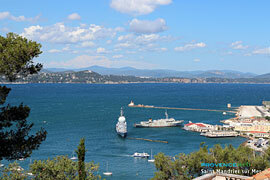 The French Navy has set up a school and a naval air base. Sports and especially those that have to da with the water are the most frequent activities here. There are two excellent scuba diving clubs. Diving is particularly good at Coudelière and Cavalas beaches. 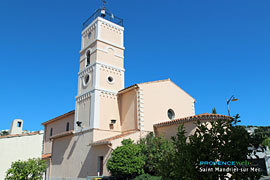 The 19th c. church. Chapelle St. Louis (open on certain days). The Franco-Italian cemetery. Harbour. Beaches. The sentier douanier (walking trail). Water sports. Numerous cultural activities. 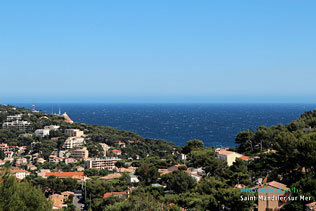 Six Fours les Plages (9 km), Sanary (14 km) and La Seyne sur Mer (9 km).